I just noticed that, in last week airings (May 8th, 2011), the 2 tokusatsu titles by TOEI shared one common theme... and it's about? The 12th episode of Gokaiger brought us to the conclusion of Joe's past struggle. 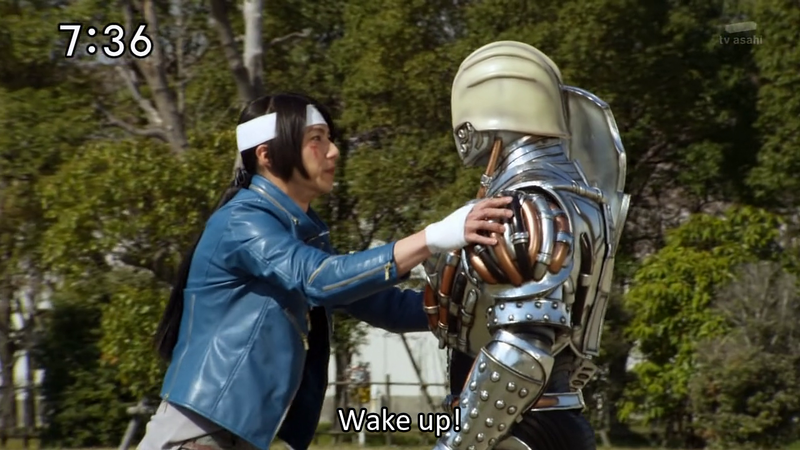 In the previous week, (episode 11 aired on May 1st) the audience were left in a cliffhanger after Joe's discovering that his senior, his sempai, the one person that he look up to, and also his best friend... has been turned into the cyborg Barizorg to serve Toiles Gils. 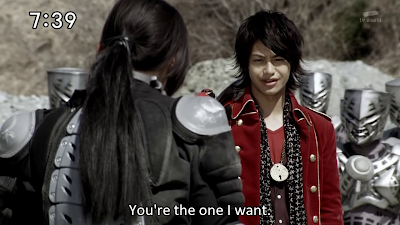 This one Gokai Galleon member, who seemed emotionless from the 1st episode - a.k.a the team Loner - finally showed tears and desperation. Several episode before, we were shown of how Joe Gibken train himself in the forest to defeat the warlord, but it didn't show all out. The 11th episode showed us how devastated he was, upon discovering the truth about Barizorg. Barizorg was once his most trusted person, who helped him when he was a Zangyack soldier. He even taught Joe his sword style, and helped Joe escaped from the troop. 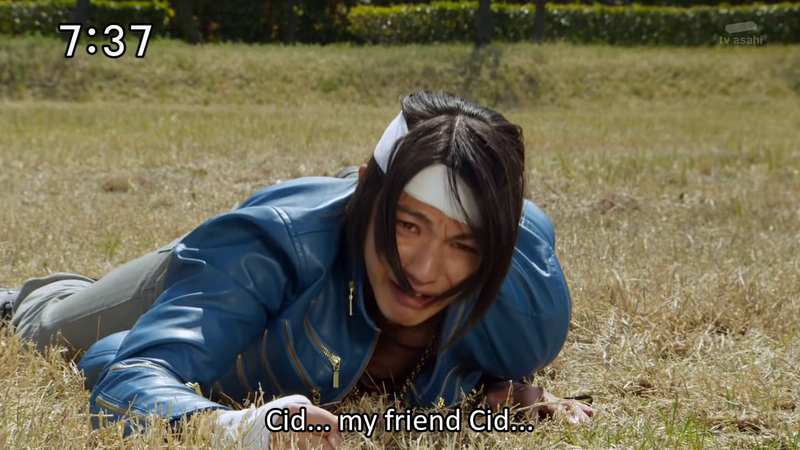 Cid was not just a friend, he was Joe's best friend, he was like his own brother. Episode 12 continued the story, with Joe leaving his Gokai team to 'save' Barizorg. 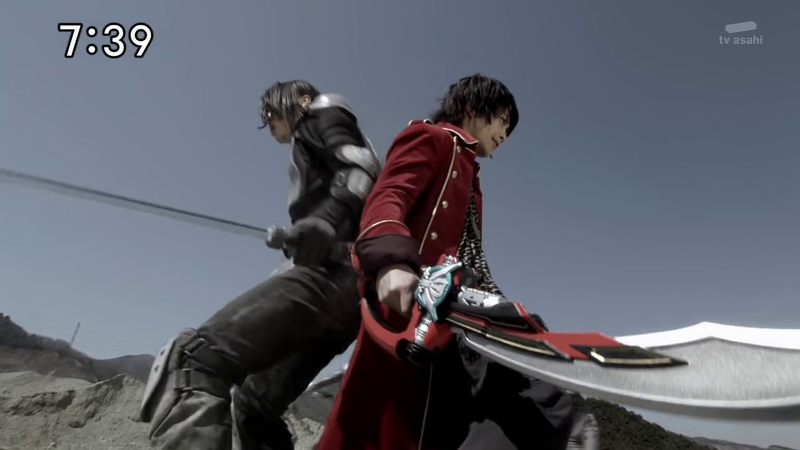 The two faced each others in a duel, with Joe continously crying as he wanted Barizorg to remember his past as Cid. It made me cried, watching Joe tried to save his old friend was heart wrenching indeed. 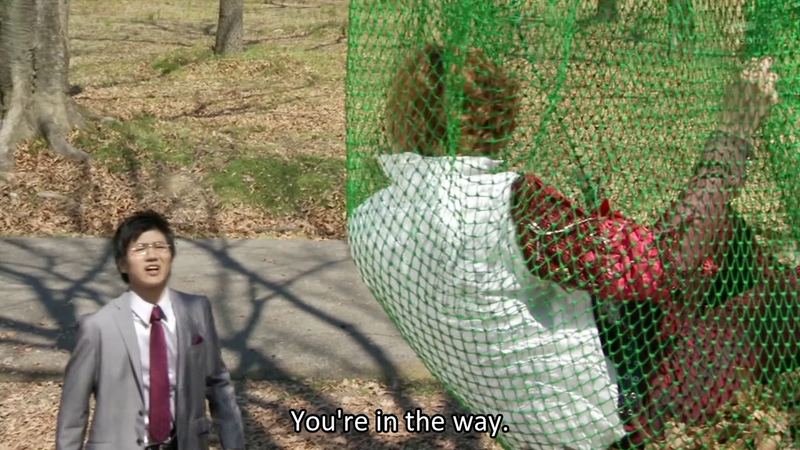 Oh, did I mention that in Episode 11 Marvelous injured himself to block Barizorg attack to Joe? Well, the wounded Marvelous shared his 'meeting' with Joe to the rest of the team. 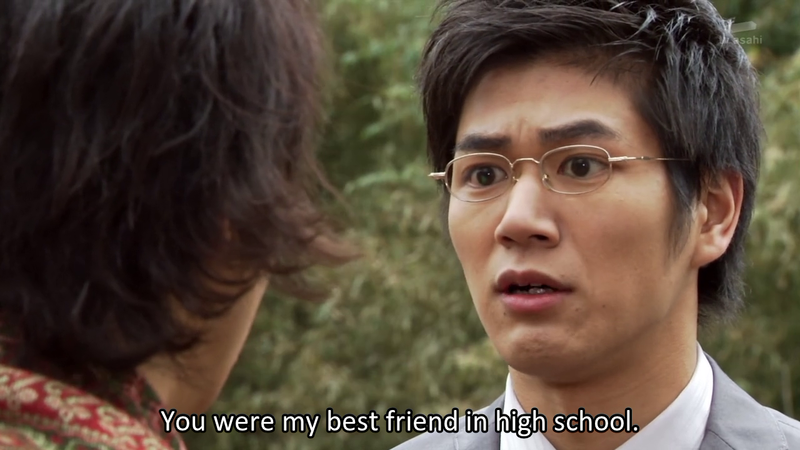 It turned out, that Joe was the first member that he recruited after he received the Gokai power from Akaranger. 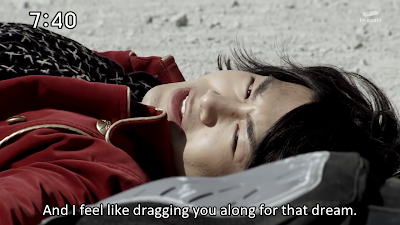 The scene was touching, Joe was running away from the Zangyack with a chain in his neck. Cid helped Joe escaped but was left behing. As he was surrounded by Gormins, Marvelous appeared and helped him. They battled as a partner, guarding each other back to back. Joe told Marvelous that he didn't have any cash to pay him, but Marvelous' answer was so touching. Marvelous: Looks like you could use a hand? After they battled out the Gormins, Marvelous risk his life to take off the electric chain from Joe's neck. As they were lying together, as the result of electrocuted... Marvelous spoke his heart to Joe. Marvelous: I have a dream. I'm going to get my hands on the greatest treasure of the universe. 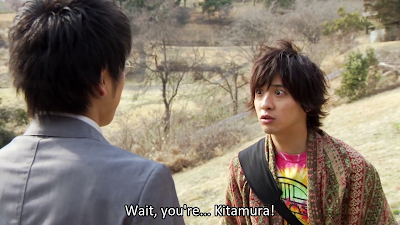 In the 33rd episode of Kamen Rider OOO, after a fierce battle where he went bersert in PuToTyra combo... Eiji Hino received an invitation to an theme park from someone who claimed himself as his best friend in High School (Shinyuu). His name was Yuuichi Kitamura. The bad part, is that Eiji himself didn't remember who Yuuichi was... Ouucch T.T. Yuuichi explains that he was a very introvert person, the class shut-in, he was a Hikikomori during that time. Eiji was the one person who always bringing him notes and all. Finally, yes FINALLY Eiji remembered about this person... (Duh Eiji... Duh Duh Duh! 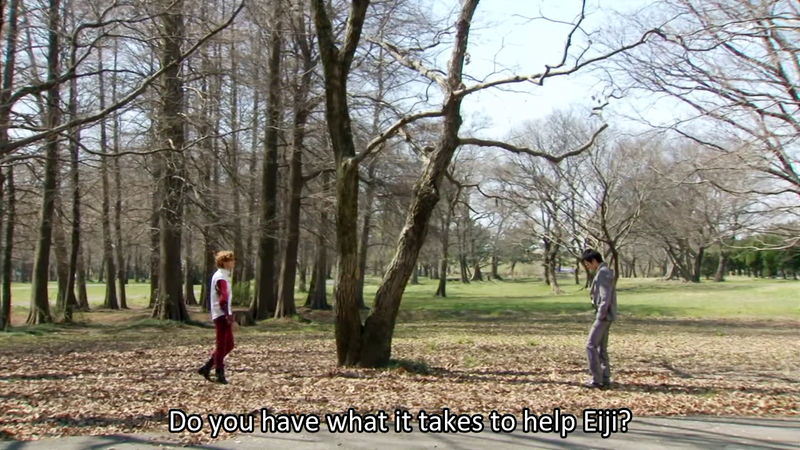 Are you a B-Type Eiji? Apparently so... Duh... Duh... Duh... >.<). 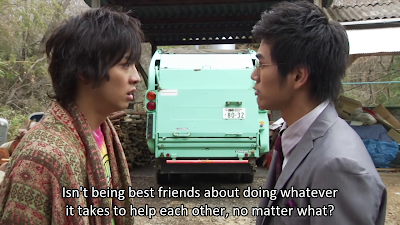 Pardon for my annoyed feeling for such an 'awesome' friend Eiji was, but this kind of person just made me want to... ... ... Duh, anyway... Yuuichi has become a successful Internet Businessman, and he's building the whole theme park. Yuuichi then revealed that Eiji was a popular guy at school, and he helped Yuuichi in his period of reclusiveness (A Recluse perhaps?). Eiji shared his dream to Yuuichi (and Eiji forgot all about this as well by the way... DUUH!!! ), and somehow that changed Yuuichi mindset, and made him wanted to work to achieve their dreams. Date then asked Eiji and the others to try out the park, and Yuuichi went away. Yes, to pay back for the friendship that Eiji shared to him. He wanted to help Eiji back. Such a noble desire indeed right? But it is still a desire, and the strength of it grew the Yummy into a fully mature Owl Yummy. 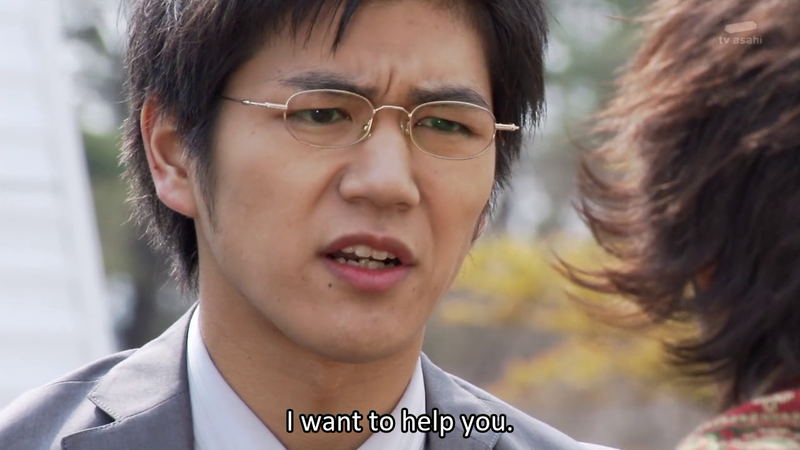 But Yuuichi did bad things in order to fulfill his desire, he trapped Hina and the others. 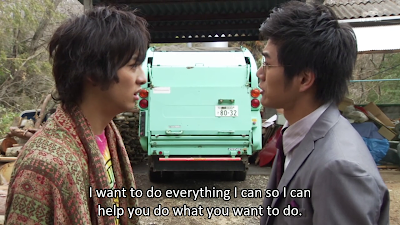 He asked Eiji to work with him, so that Eiji can fulfil his dream to build a children's aid organization that Eiji has been telling him everyday in high school. 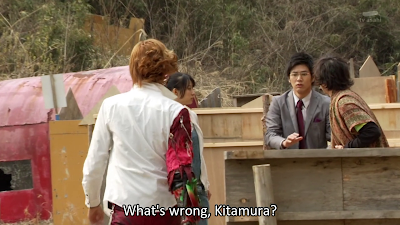 He feels that the others, especially Ankh is just using Eiji. And even has to wonder if they are really best friend..... Aaarrghhh... 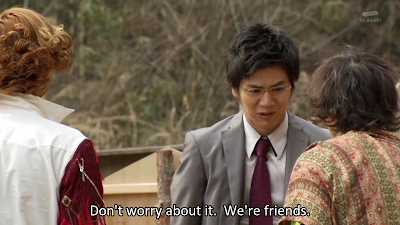 I think I just lost my respect to Eiji here -_- because Yuuichi sincerely consider Eiji as his best friend. Yuuichi then helped Eiji to find Hina who was lost (by his own doing, of course). Yuuichi trapped Ankh because he felt that Ankh's presence is an annoyance for his friendship with Eiji. 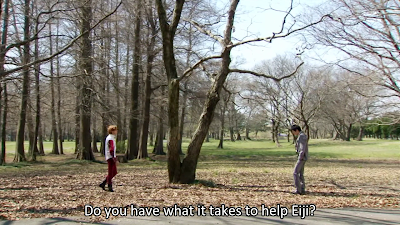 He asked Ankh to leave Eiji alone, because he doesn't know him (and to be honest, I'm with Yuuichi here, because all these time Ankh actually only USING Eiji to get his core medals). 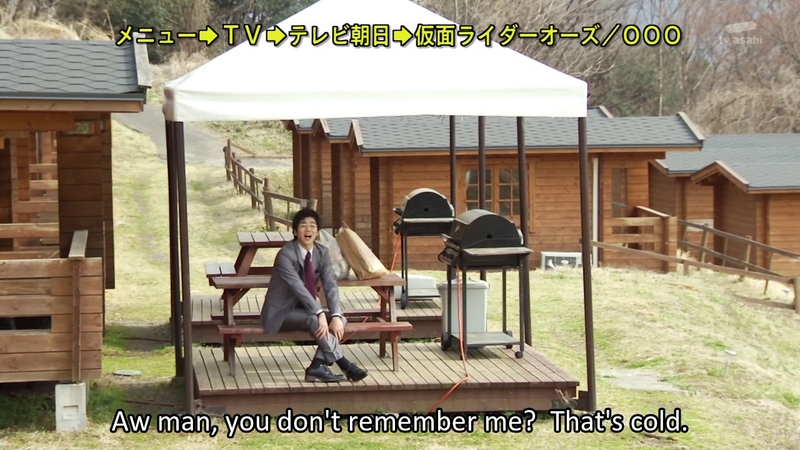 Well, the episode was finished like that, and the conclusion to it will be on the 34th episode next week. With that in mind, I will continue my blog next week after watching the conclusion for the OOO's one. The one that will be entitled: Best Friend, Manipulation and Relationship.